A guide for the jumper arrangement and Power connector. 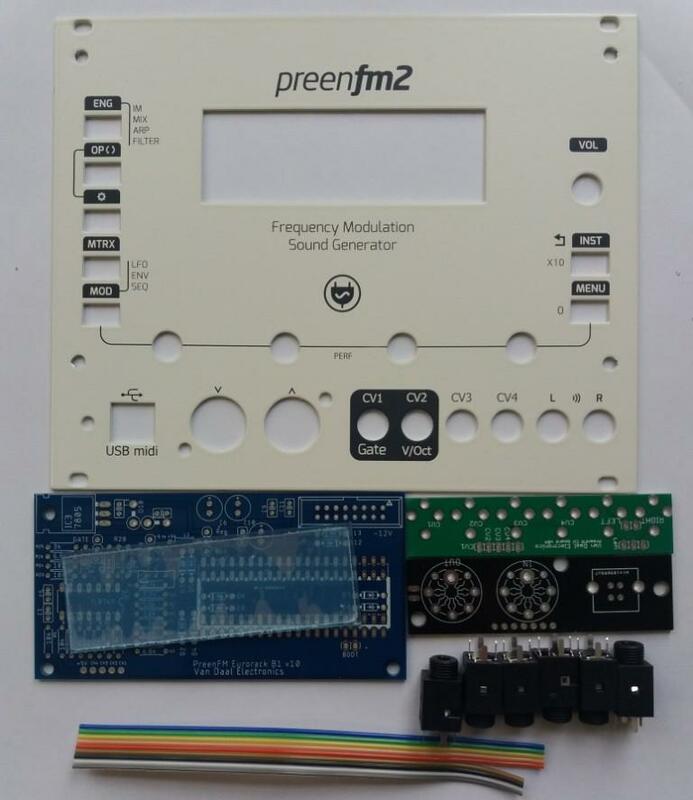 We have realeased a DIY kit to build your existing PreenFM into Eurorack module. Its a full kit. You will have all the parts you need to do it. Due to differences in some version some extra steps and parts might be needed to complete the mod. This is awesome news !!! Thanks Ardi for your work on that, I'll announce that tonight on facebook after i update github with the schema and the official CV firmware. 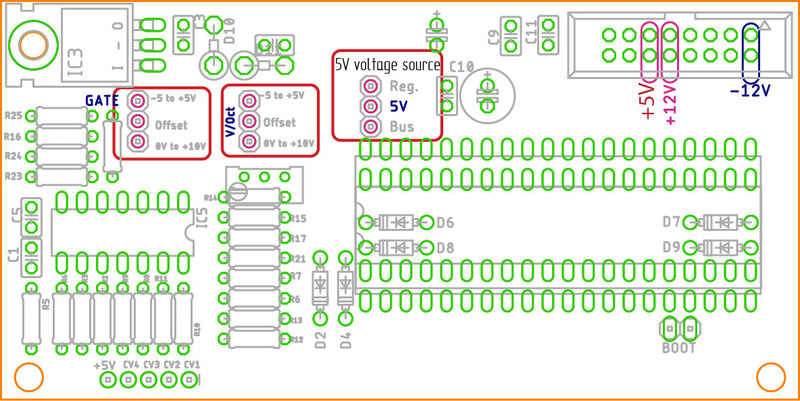 Do you have a diagram of the electronic board? The rest 8 are Schotkey. So 4 diodes in the PSU section or Upper section of the board are 1N4XXX. L1 can be replaced with wire. It might need an inductor if you have very noisy 5V supply in your eurorack. USB + and - should be wired to the PReenFM main board. There is a connector labeled USB 2- 3+. Also. Dont forget to do the V/OCt callibration procedure. I have now also bought the conversion kit and am still very disappointed. Which software version is needed and where can I get it? Is there a reasonable construction manual for the modification? What about the IC3 7805? Do I have to solder it in? Where is the circuit diagram? I'm really in doubt whether I'm going to do the modification. The information is nevertheless very daring. Has a user of the Preem already done the modification? What is your disapointment about? You need to poulate the boards and wire it together and your are ready to go. I will answer all your questions by email. 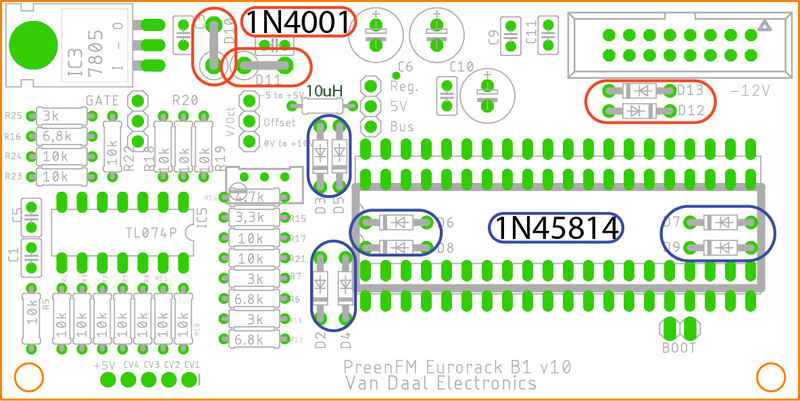 Firmware is available on PreenFM Github. The modification has been done by many users. Another step on the way. 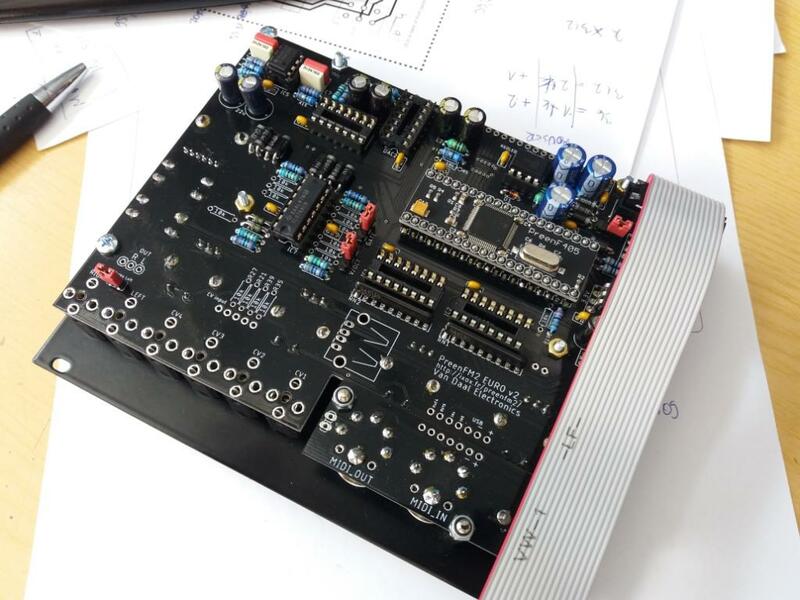 A dedicated PCB for Semimodular/Eurorack design. The depth of this module is 3cm. Which makes it Skiff ready. A special Skiff is in developement. That will allow to use USB to power the system. ok, thanks for your information. I will try to do it. the modification is not implemented. Version P2_209A.BIN has this implementation. So you can't use the overclocked version. Otherwise the rebuild worked and it would be nice if the version P2_209AO.BIN is supplemented with the CV. Version P2_209A.BIN has this implementation. I cannot check this week as i'm far from home. Can be a mistake when building the zip file. My be after Eastern you can fix it. I can confirm that they both work and are fully functional with CV ins. I just downloaded the file again and installed it: and behold, everything is fine. Somebody should understand that. Now all I have to do is figure out how to get a preset of a sound by turning it on.